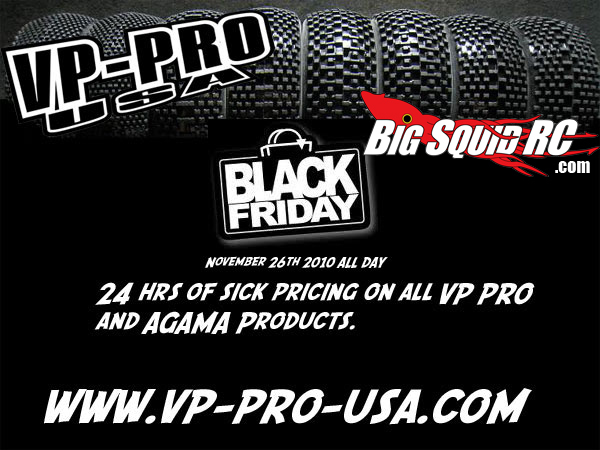 VP Pro USA Black Friday Sale « Big Squid RC – RC Car and Truck News, Reviews, Videos, and More! VP Pro USA is not only giving you 15% off everything on Friday (use code: VPBLACK), but they also have various different BLACK BAG items throughout the day at killer prices. But wait, there’s more! While supplies last, every order on Friday will get a FREE black VP PRO shirt! Log on to VP Pro USA on Friday, and take them for all they’re worth!